Back in July, I started what I’m hoping to be a tradition for me and for Davey. I started writing letters on his behalf and sending them along with pictures on a monthly basis to a few friends and family who live out of town. Most of you are aware that my husband’s entire family lives in Western NY. For the most part, we are able to see his mom and sister at least eight times a year. We rotate trips back and forth. For the rest of his family, we try to squeeze in some time with them while we’re in NY. Unfortunately, that’s only about four times a year and they miss out on a lot with Davey. Being a writer, I decided to start using my talent for something else. I decided to write letters from Davey’s perspective. My husband has two grandmothers who are still living, Davey’s great grandmothers. They don’t have access to email or Facebook, so they rely on us to keep them up to date with Davey’s growth. The majority of the rest of the family, has some sort of internet access, but it’s a lot more fun for me AND for them to send a letter via the mail. Let’s be honest, you all think it’s nice to receive something in the mail other than credit card offers and bills. Thanks to the increase in stamp prices, though, Davey will stop sending letters to some of our friends since they’re a part of our generation and have email. By the way, he has his own email account too. I will; however, continue to send letters and pictures to immediate family especially to my in-laws. Here’s a sample of one of the letters Davey has sent in the past. It’s a neat idea, can be pretty inexpensive (all dependent upon who you send them to and the number of pictures), and definitely warms the heart of its recipients. And oh yeah, Davey gets a copy emailed to him as well. I look forward to the day when he’s able to read his own email and start writing his own letters. 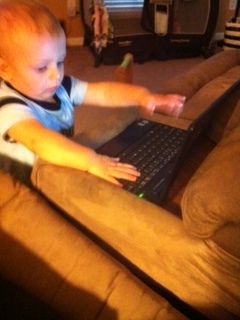 Davey honing his typing skills months ago!